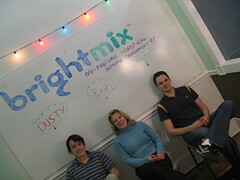 Brightmix » Blog Archive » BrightMix Welcomes Erin! After about a month of posting jobs and interviewing candidates for our first developer position opening, we’re happy to welcome aboard Erin! Hooray! Erin brings to the table a lot of programming and leadership experience. Oh, and she’s nice and we like her! 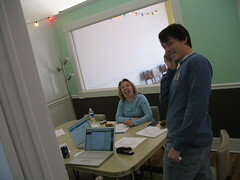 We spent the majority of the day in the ol’ conference room. In the morning, we went over the in’s and out’s of our business, and in the afternoon, we went over a lot of the details about our clients and our current projects. There’s a lot more going on here than we expected—definitely way more than someone can absorb in one sitting, but Erin bared with us. 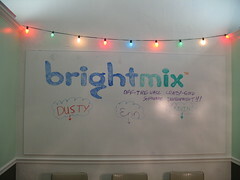 BrightMix WhiteBoard Timelapse from BrightMix on Vimeo.